I am in love with tomatoes. It may sounds crazy, but I’m head over heels in love, and addicted to them. Who the hell eats tomato as snack while watching TV? Me. The irony is, I remember my mother used to force me to eat tomatoes when I was young and back then, I gave all sorts of excuses not to eat them. I only started to like them after the beauty blogger told me about the benefits of having tomatoes. Okay I digress, but there’s a reason why I’m talking about tomatoes — Spanish cuisine makes heavy use of ingredients like potatoes, tomatoes, peppers, beans and mushrooms. Honey, we are having Spanish food today! Zsofi Tapas Bar is a quirky and fun Spanish restaurant located in the heart of Little India, Singapore. I know it’s a rather strange place to go for Spanish food, but hey, there’s French food in Little India too! Look at that beauty up there. Tell me, who can resist not eating the Spanish Paella? I think the Spanish Paella is an amazing creation. 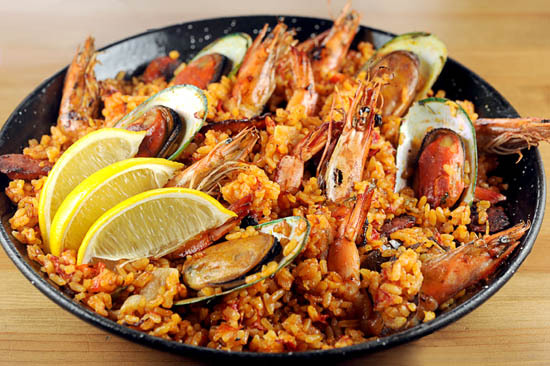 It may seem simple enough to throw in a variety of ingredients like prawn, mussel, tomatoes, chorizo, saffron into a pan, but preparing a good paella is never easy. I like the Paella Valecia ($35) from Zsofi Tapas Bar. Tasty isn’t exactly an appropriate word to describe it since there are so many flavors within. I’m not too sure if this is the best Spanish paella in Singapore since I haven’t tried that many before, but it is definitely one of the better paella. Be it with a group of friends, or in the company of loved ones – I love the idea of having Sangria with a few Spanish tapas and Paella after a long day of work. One day, I’m going to fly to Spain and take lots of photos to make all of you jealous. But until then, I can only visit the Spanish restaurants in Singapore to satisfy my cravings for paella, chorizo, churros and Spanish Tapas. Sometimes, it’s good to step out of our comfort zone and explore new places and experience new cuisine. 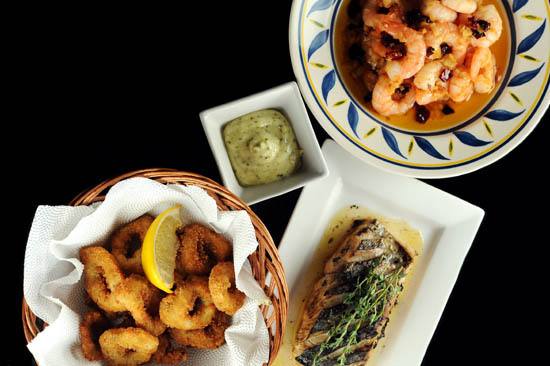 If you have never tried Spanish Cuisine before, it’s time to read my list of Spanish restaurants in Singapore. Zsofi Tapas Bar serves a free tapas with the purchase of every alcoholic drink. Oh this makes me wanna return to Barcelona and get me some paella! rabbit paella is supposedly great. dont think they serve it locally though. As for tomato as snack while watching TV..I’ll surprise you but that’s also me! Lol. Ihave a little garden in my backyard from which I just grab couple of fresh ones and nibble on them like snacks. the best spanish paella is in malaga, spain!u should go there to try it if u are visiting spain. they uses the freshest ingredients because they are near the coast. and its really cheap! we paid like euro 7 for two people. AMAZINGLY CHEAP. I was quite surprised when the place was practical ly empty on a Saturday eve since the place was packed at my last visit over two years ago. Of course the reason was quite clear when the food arrived! The paella which as described above was very flavourful was actually a rip off at $38 this time round. Instead of prawns there was the cheaper frozen shrimps you get off the supermarket shelf. Also no chorizos unlike the last time!’ It was simply a fried rice with some flavourless shrimp and mussels with a few slices of lemon thrown in to disguise itself as a paella. We also ordered potato bravas which this time was a disappointing medley of fried potato chunks covered in a thousand island topping. When asked how come there is no crispy bacon bits as described in the menu we were told they have run out of it. Wish they had the decency to inform us of that before we ordered since we would have gone for a different option then!